A steady drippy rain made us all (birds and humans alike) pretty wet and cold this morning, so when the sun came out in the afternoon, the birds really went to work hunting. There was so much action at the buckeye tree in my backyard, I managed to shoot over 100 photos in less than two hours. One bird really stood out, because I had only seen it from about 500 feet away during the morning bird-watching session. But this afternoon I managed to creep within 20 feet of the bird while it searched for insects in a small, almost leafless tree. 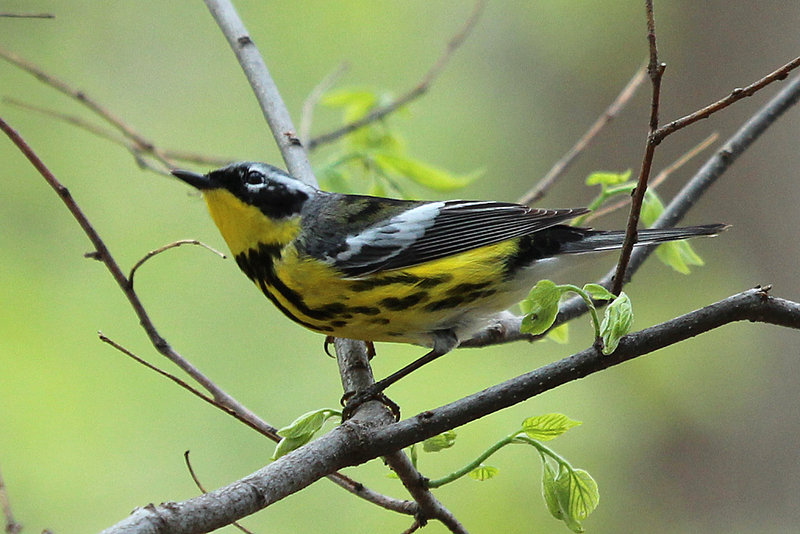 Magnolia Warblers are striking looking birds with their combination of black, white, and yellow colors. Eyes focused upward on the prize — this is the pose the bird assumed right before launching itself at an insect flying above its head. Why the name Magnolia? 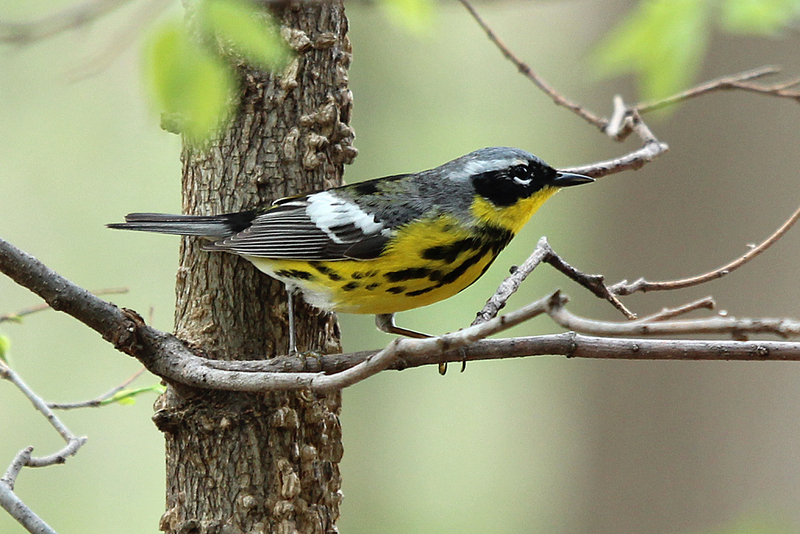 Apparently, the bird was first collected in the early 1800s from a magnolia tree in Mississippi, but it was originally called “black and yellow” warbler. This species breeds primarily in Canada and winters in Mexico, Panama, and parts of the Caribbean, so an unlucky migrant through the southeastern U.S. became the type specimen for its identification. 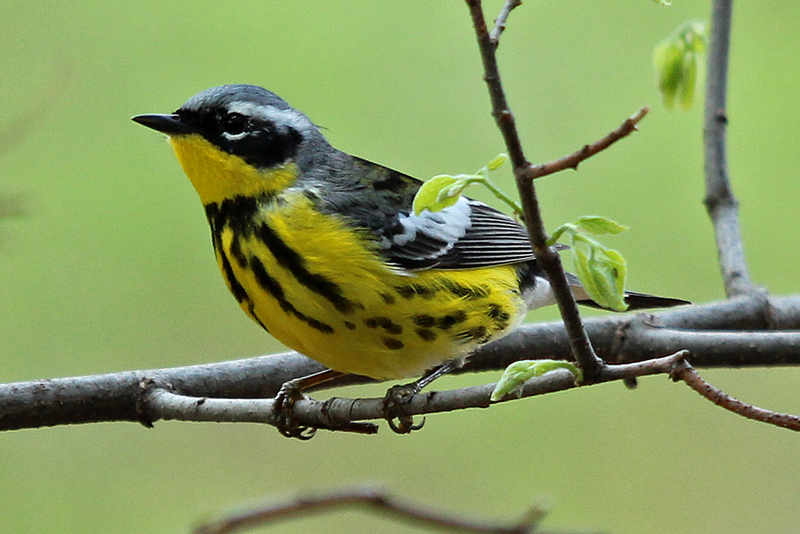 The white wing patch, black mask over the eyes, white eyebrow, and black stripes down its yellow front are key diagnostic characters that identify Magnolia Warblers. There must have been some good bugs in this little tree, because the bird bounced around from limb to limb for at least 10 min while I clicked away. This bird was so cooperative and so good looking, I decided it deserved its own separate post. More of the afternoon photo shoot will appear in later posts. This entry was posted in Birds, spring and tagged bird migration, Magnolia Warbler, Setophaga magnolia, spring migrants, warblers by Sue. Bookmark the permalink. Wonderful shots of a beautiful bird. Your persistence pays off again–a bird this small and this active is definitely hard to capture without too many offending branches. The color combination on its body is simply stunning. Thanks, Mike. I think this species might be one of my favorites, but I have yet to capture the unique colors of the Blackburnian Warbler, which is also stunning. My photo technique has become one of sitting in one spot and waiting until something interesting comes into view and then trying to sneak up on it to get closer. That worked for the warbler, the tanager, and others I photographed that day. But that works best when there is such a beehive of activity, like there was after the morning rainstorm. Oh, he’s just gorgeous, Sue! I’m so impressed with the close-ups you are getting. You should be very proud. Some of them look like magazine covers to me! So professional, and sharp and clear, too. Great job, and good info, as always. I had never noticed the half-ring of white under the eye before. Of course, I think I’ve only ever seen one of these, and it was certainly nowhere near as clear a glance as these pictures you have captured. But should I see one again, I will know what to look for to be sure I’m ID-ing it correctly. I always, always look forward to your posts. Well thanks, Marcia. That is a very nice compliment. I have certainly enjoyed learning more about photography and trying all the tips I read on others’ nature blogs. The yellow-rumped warbler also has that little white ring under the eye, and resembles the magnolia a bit in yellow, black, and white coloration. You’re welcome. You’ve earned it! I am very familair with yellow-rumps, which I learned to ID as Myrtle warblers, back in the day. We have kajillions of them down here, even passing through my own suburban yard. Because I see so many of them, I don’t think I would get them mixed up, but I’ve never noticed the white under the eye. I just see the black and white coloration and that yellow rump patch. I will look for the eye markings, too, next time, just to see if I can pick them out. That “necklace” on the magnolia is truly beautiful, isn’t it? I must be sure I don’t take for granted I’m seeing yellow-rumps, and look closely, in case there’s one of these guys lurking around with them. I’ve seen yellow-throated warblers in mixed groups now and then. I guess it always pays to look closely, and not take anything for granted. Exactly! I think I may have missed quite a few Magnolias when I saw so many of what I thought were Yellow-rumps in the tree tops. I would catch a glimpse of something black and white with yellow, and immediately look away. Gotta train that eye to pay closer attention…next time.